Musical Ecologies continues Thursday October 13th with New York-based composer and sound artist Andrea Parkins. Widely regarded for her improvisational electroacoustic performances, Parkins will perform her solo project, with electronically processed accordion, amplified objects and small instruments. A subtle sonic and embodied exploration of objects and surfaces, the work explores the layering of extended accordion techniques with electronic feedback and live-sound processing through her self-designed virtual instruments. The evening will begin with a conversation hosted by series curator Dan Joseph, and a reception will follow. Andrea Parkins is a sound artist, composer and electroacoustic improviser engaging with interactive electronics as compositional/performative process. She is especially known for her pioneering gestural/textural approach on her electronically-processed accordion and self-designed virtual sound-processing instruments. Described as a “sound-ist,” of “protean,” talent by critic Steve Smith, Parkins creates sonic fields of lush harmonics and sculpted electronic feedback, punctuated by moments of gap and rift. Her works include sound installations, ensemble pieces, electronic compositions, and live sound design for dance, film, and intermedia performance. She has collaborated with Nels Cline, Stephen Vitiello, George C. Lewis, Matthew Ostrowski, Rova Saxophone Quartet, choreographer Vera Mantero, filmmaker Abigail Child, and many others. 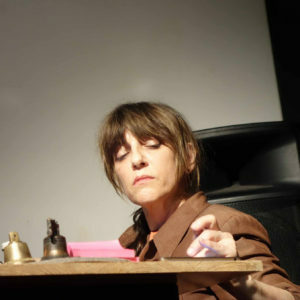 Parkinsʼ work has been presented internationally, at the Whitney Museum of American Art, The Kitchen, Issue Project Room, Experimental Intermedia, Mexico Cityʼs 1st International Sound Art Festival, Kunsthalle Basel, Cyberfest (St. Petersberg), and Q-02 Workspace for Experimental Music and Sound Art (Brussels). Parkinsʼ recordings are published by Important Records, Atavistic, Henceforth Records, and Creative Sources. In 2016, XI Records will release Parkinsʼ long-form electroacoustic composition, Two Rooms from the Memory Palace, and her duo with drummer Brian Chase will receive its debut release on Confront Recordings. Comments closed — Trackbacks closed RSS 2.0 feed for these comments This entry (permalink) was posted on Thursday, September 15, 2016, at 3:43 pm by Dan Joseph. Filed in press release.